Sometimes things just fall into place better than could been planned. I got in touch with Arkadiusz Komski to discuss Jewish heritage work in Sanok. We met at the Słotki Domek Café in Lesko. 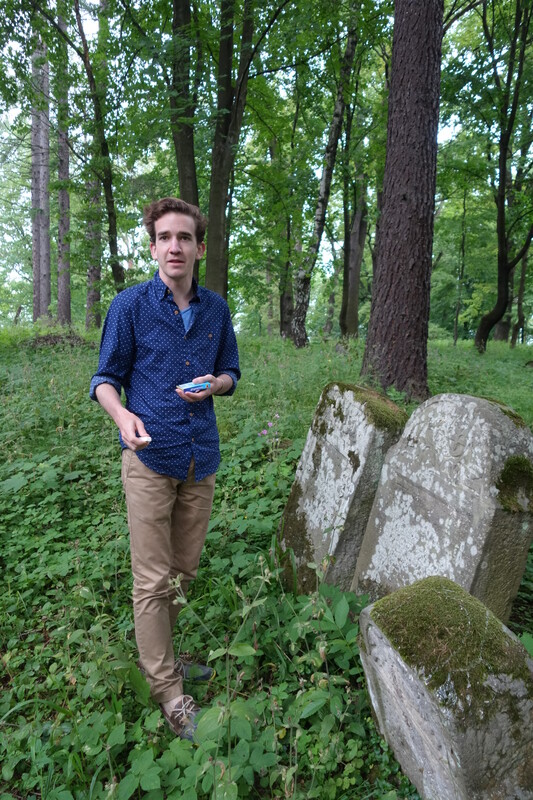 In addition to being a wealth of knowledge about the history of Jews in the Sanok region, Arek told me that Rabbi Edward Boraz was scheduled to come with a group of Dartmouth students to clean up and inventory the Jewish cemetery in Lesko. I knew I needed to stay an extra day to meet them, and I’m glad I did. Boraz has been at Dartmouth since 1998. As town rabbi, head of the campus Hillel, and professor in the medical school, he wears many hats. 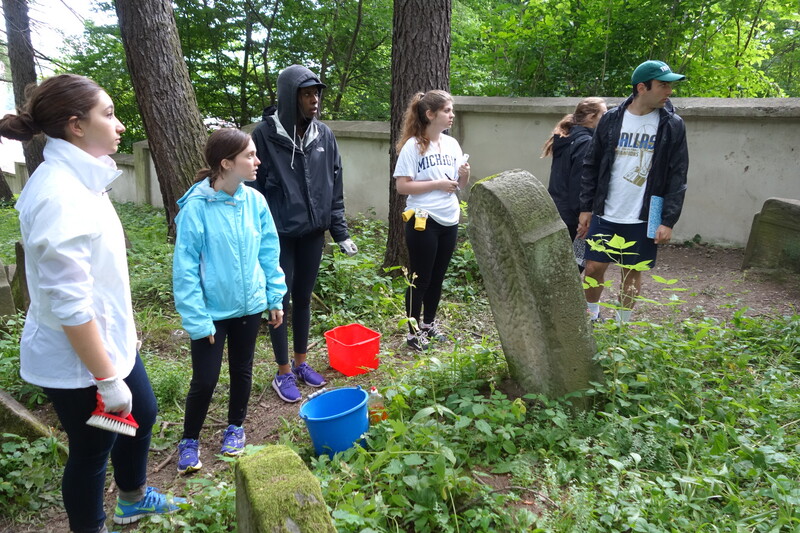 Also, for the past fifteen years, he has led a summer trip to a different town in Eastern Europe to clean up a Jewish cemetery (called Project Preservation). Students receive no academic credit for participating. Before the trip, they attend ten weekly seminars, and read and discuss a range of relevant literature. This year, they focused on the intellectual foundations for the Holocaust, and how science and medicine were used as tools to develop the techniques for mass murder. The group spent about a week in Poland. They flew into Krakow, visited Auschwitz, the synagogue in Łańcut, and the death camp at Bełżec (where many Jews from the Lesko region were taken). Then they came to Lesko. They were scheduled to work about four days at the cemetery, with a day off for Shabbat. They also held a short Shabbat ceremony in the Lesko synagogue building. When I met Boraz the night he arrived, I spoke more than I should have. He asks good questions, and is a good listener. He explained that he likes to hear peoples’ stories. Still, as an ethnographer, usually I’m the one who asks the questions and listens to peoples’ stories. Rabbi Boraz says thanks to the help of Arek Komski, Ewa Bryła, and her brother Piotr, this is the fifth time he has returned to southeast Poland. They help coordinate all the logistics, bring equipment and people to help cut the grass, act as translators, and provide information about the region. Meeting with Rabbi Boraz and his students seems like a fitting bookend to my year in Poland. When I arrived in Poland last August, I just missed them. In Lutowiska, I walked up the new steps they had built and through the gate they had mounted at the cemetery entrance. 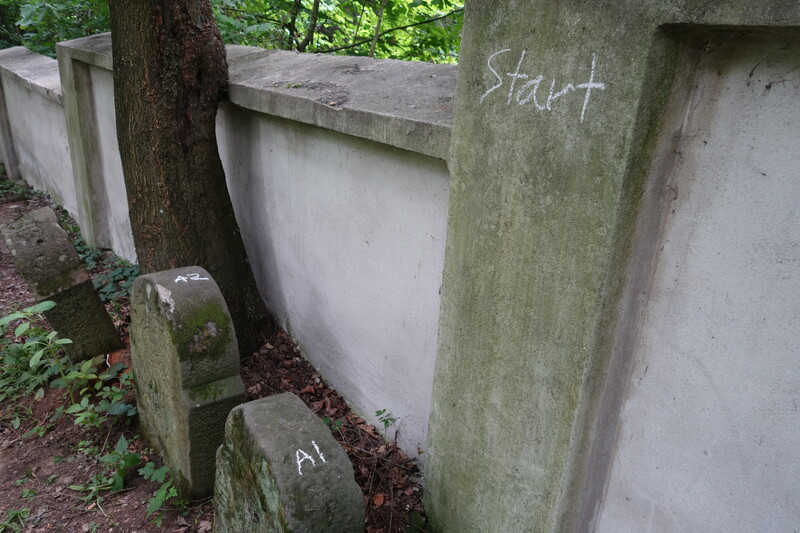 I followed in their footsteps along the paths through the cemetery and looked at the tombstones they had cleaned. This year in Lesko, I chatted with the students before they began work and asked them what motivated them to sign up for the trip. About half were raised in Jewish households, some more reformed and some more conservative, while the rest were from a variety of backgrounds. Some grew up in neighborhoods with a lot of Jews, others with almost none. They had various levels of familiarity with the history of European Jews and the Holocaust. Some were interested in the project because they knew Holocaust survivors or because their own distant ancestors came from this part of the world. Others focused on the service component of the trip; they wanted to contribute to the preservation of Jewish culture. Still others expressed an interest in history. The students were impressed by the age and charm of Krakow, although they weren’t so sure about some Polish food practices. It struck some as odd that normal life goes on in the Polish city of Oświęcim right next to the death camp of Auschwitz. They found the tour of the death camp was unsettling, though one student said reading about Holocaust history had a greater personal impact. some set about photographing, transcribing, and translating inscriptions, others used soft brushes and water to gently clean the stones’ surfaces. They had to be especially careful because most are of a soft sandstone which is prone to fracturing and wearing away. Many are covered with moss that provides a degree of protection but can also obscure the inscriptions. An additional complication is that some varieties of moss are endangered and protected, and thus not to be disturbed. The Americans were joined by Poles—a woman who moved to the area from Warsaw with her two teenage daughters and another teenage girl. Some more local residents joined the group in the Lesko synagogue for the Shabbat service Friday afternoon (see mojelesko). The Jewish cemetery in Lesko is the oldest and largest in the region. The earliest tombstone dates from 1548, and over 2000 stones remain on the site. It was one of the first places I was taken by a couple of local teens who showed me around town when I moved there in 1992. Nevertheless, the cemetery was talked about as a place to hang out with friends away from the scrutiny of adults. Little was known about the former Jewish population, and even less was discussed in public. I hope this is changing, even though (or perhaps because?) few witnesses remain of the prewar community and the removal and murder of Jews.